Looks like this is caused by the new PolicyKit setup. * On entering the blank password a 'Cannot mount volume' error appears. I think hal is doing this (via hal-storage-mount). My conjecture is that hal-disable-polling needs to be called on each drive to turn it off. ... and see if it behaves the same way? Something like "sudo hal-lock --interface org.freedesktop.Hal.Device.Storage --exclusive --run /usr/sbin/ubiquity" should help, if we can put that into the desktop file? With blocking mounts at the hal level, we can also drop the various nautilus/g-v-m/KIO configuration tweaks. If so, something like this attachment would do the job. It installs fine now, but on completion it does open a nautilus window at /lib/var/OS-prober on the Live file system (other disks are not mounted). and that works fine as well. 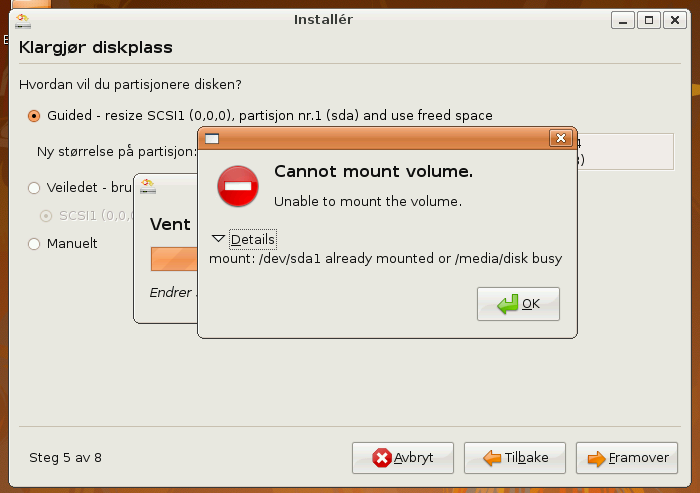 * Disable the intro message in preparation for Ubuntu 8.04 beta. * Run ubiquity under hal-lock if possible (LP: #199129).